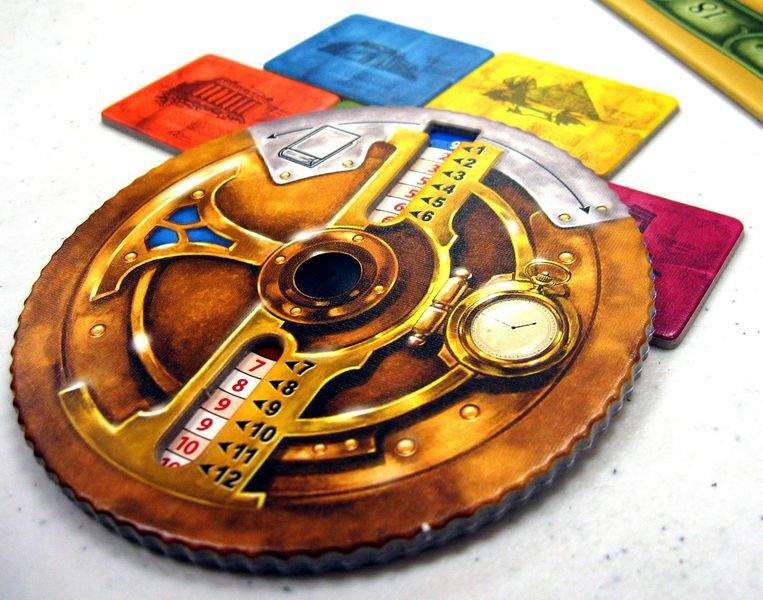 The Time Track mechanic is one of my all-time favorite mechanics for generating excitement and a new kind of challenge in contemporary gaming. In the Time Track mechanic the player turn order is variable and is based on the kinds of actions the player previously took. As a result, players might get to make two, three or even more turns in a row to compensate for the fact that the previous player took an action that gave him/her great benefit but took a lot of time to accomplish. Because there is a very neat balance between the amount of time spent to accomplish an action and the potential benefits of taking these actions, there's a dynamic tension the player needs to manage every time it becomes their turn. A really interesting mechanic for helping students understand the value of time, the amount of time it takes to actually accomplish certain goals and the trade-offs between going fast for a few points or taking the long way for potentially many, many more points. In this game, players are choosing between different modes of travel to accomplish an around the world journey, á la Jules Verne. Players have the option of choosing trains or ships, but there has to be a correspondence of cards in order to allow the player to make a particular choice. The winning player is the player who made it around the board in the fewest number of days. Chaosmos features a universe in a state of active and ongoing collapse. In this game, players travel from planet to planet gathering secret knowledge in the hopes of attaining control of a powerful tool that will allow them to survive the end of the universe. The Time Track is just one of the many mechanics in this exciting, tense game. Neuland is an old classic that should be, in my judgment, much more highly rated than it actually is. Some game writers suggest that Neuland was the originating game of the Time Track mechanism and in Neuland, it works exactly as I described above. In this game, players are constructing logistical supply chains of goods and materials to construct buildings that allow them to place their family coat of arms on the board. The first to accomplish this wins. The most significant and accessible implementation of the Time Track mechanic is found here, in Thebes. In this game of competitive archaeology, players are trying to acquire the knowledge necessary to more effectively dig ruins in the Middle East and Greece. Every action the players take has a certain number of time units required to execute the action. Digging in ruins is the most time exhausting. A brilliant game with very high replayability. One of the most beautiful games to be published in recent memory, in Tokaido the players take on the role of travelers along the Japanese royal road. Players travel from hostel to hostel having adventures along the way at different kinds of rest stops. A player is welcome to choose a lucrative stop far down the road at the cost of not being able to make many picks or could choose less desirable stops in the hopes of accumulating a lot of them. Some say it's more of an experience, but it's a great model for how to use games as assessments.